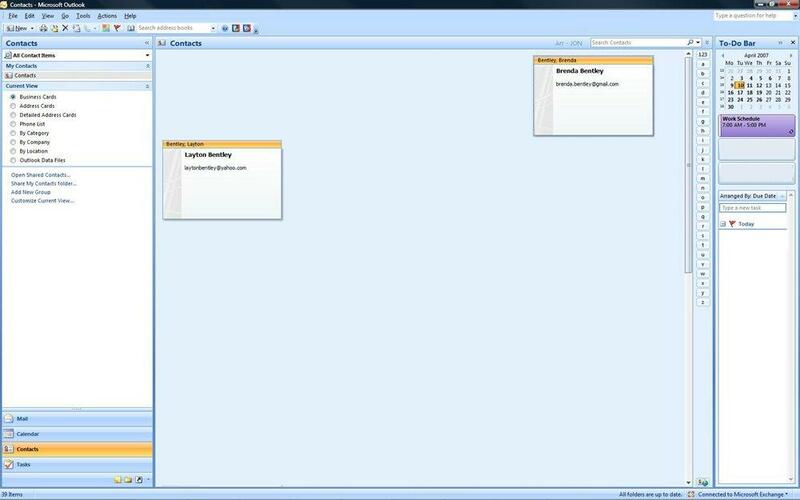 This has many uses and the same basic logic can be used for exporting and moving your 'inbox', 'calendar', and 'tasks' as well. 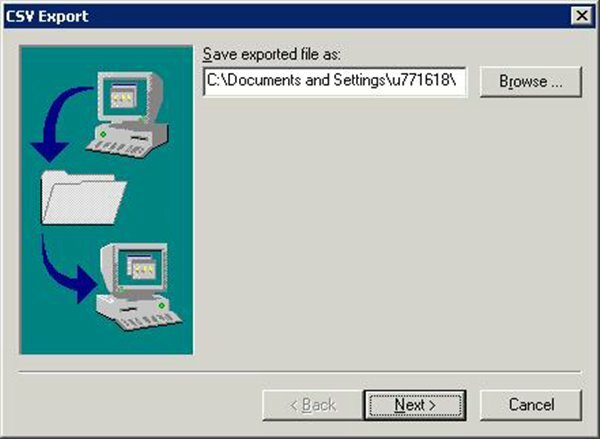 These steps were done to convert, export, and move 'My Contacts' from a Windows 2000/XP equivalent computer running Outlook Express to a Windows Vista computer running Microsoft Outlook 2007, but the steps should basically be the same for any of the Windows family operating systems and Microsoft Office family Outlook versions. Note: I received the following error multiple times during this importation process, however clicking on "OK' and dismissing the error did not seem to have any negative affect on the overall success of the importation. 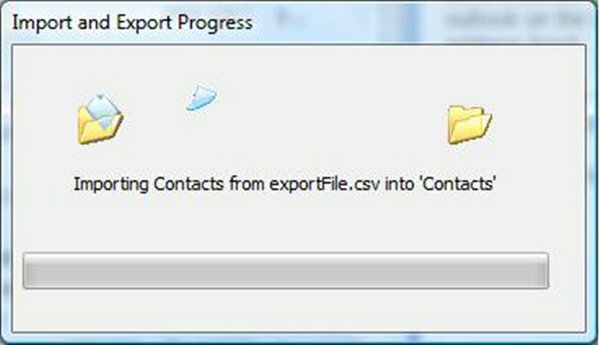 2 - Be sure to select 'Text File (Comma Seperated Values)' from the option and click 'Export'. 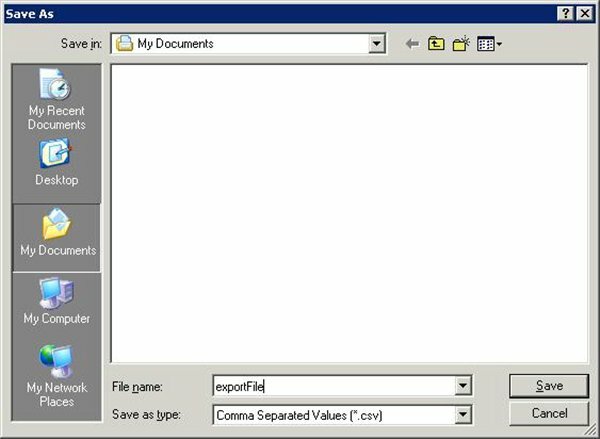 Comma Seperated Values are commonly referred to as 'csv files'. 3 - Next, you have the option to choose I file name. I rocommend choosing the 'Browse' button. This makes it easier to know where the file is located for future steps. 4 - After selecting 'Browse', select the location and name for the file to be exported. I recommend saving to your 'Desktop' or the 'My Docuements' folder for simplicity of remembering where the file was saved. Click 'Save' when you are satisfied with a location and name. 5 - After clicking save, you will notice that the location and file name has been prefilled for you now. Select 'Next'. 6 - In this step, select the information that you want to export. Generally, you'll want to make sure that all options are checked. You can check or uncheck items by clicking on the box next to the item. Click 'Finish' when you are done selecting items to export. 7 - You will now notice that the status bar accross the bottom of the 'Address Book Export Tool' window will be filled. You should then get the 'Address book export process has completed' message. Click 'OK'. 8 - You can now open the location of the file using Windows Explorer to view the exported file. You may also need to copy this file to an external location such as a disk, USB Jump Drive, or some other format of external storage accessable by the other computer. This file will be used in the importation process. 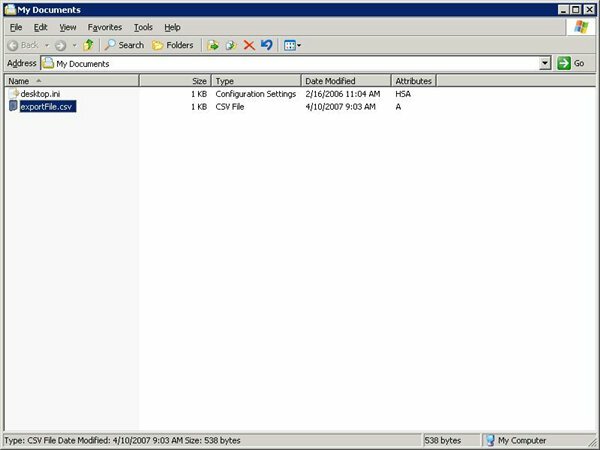 9 - If you open the file with notepad or some other csv reader such as Microsoft Excel, you should see the following format. 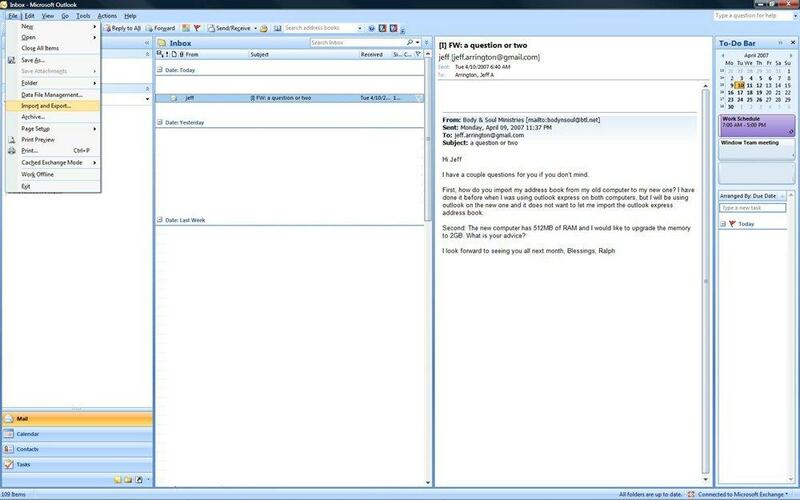 10 - The next step is to start the importation of the file into Microsoft Outlook. First, choose 'File'->'Import and Export...' from the menu. 11 - You will now be presented with the following window. 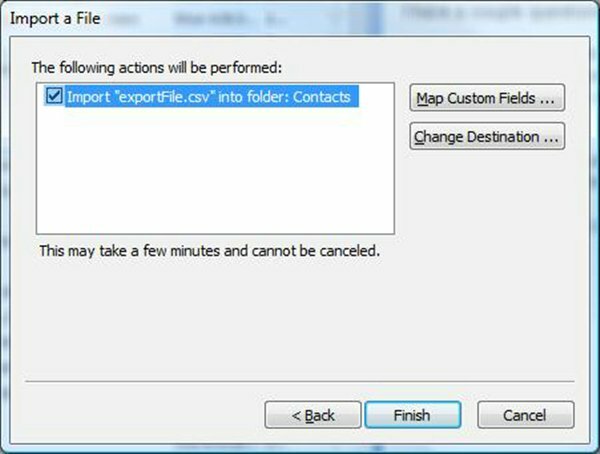 Select 'Import from another program or file' and click 'Next'. 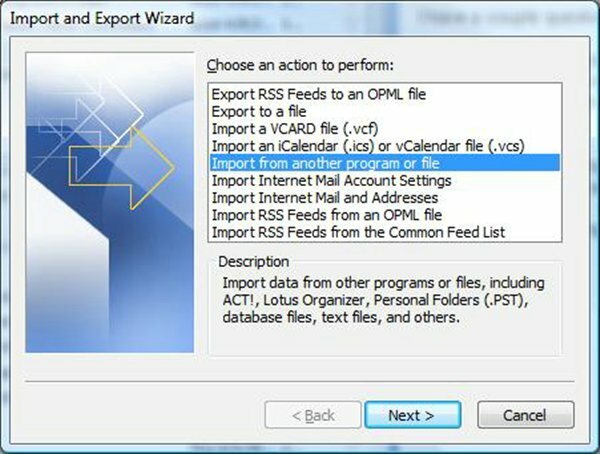 12 - In this step, select the exported format of the file. 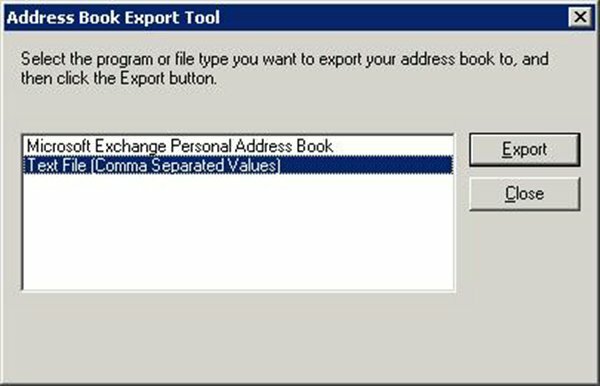 We chose a csv or comma seperated value file, so select Comma Seperated Values (Windows). Note, you could also use Comma Seperated Values (DOS) as well, but that may not work in all instances, I simply recommend using the Windows version. Then select 'Next'. 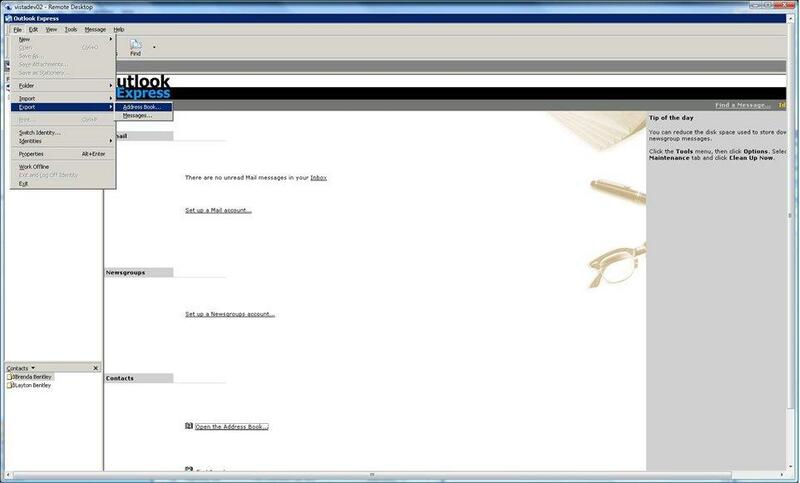 13 - Next, we will instruct Microsoft Outlook which file we want to import. 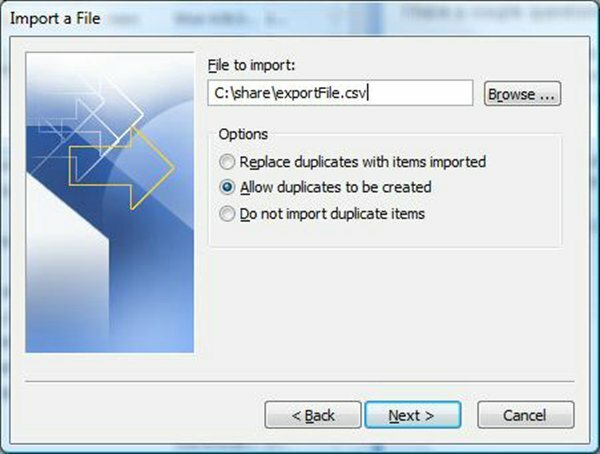 Using the browse button, navigate to the file that should be stored on an external device that we exported to in steps 1-7. 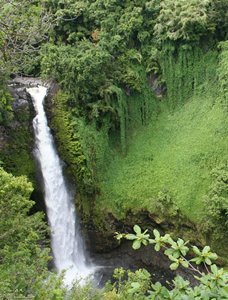 You may also want to choose one of the applicable options for your desired result. I chose to allow duplicates to be created. Click 'Next' when you are satisfied with the options and have selected the file to import. 14 - Next, you need to select the destination folder. Since we are importing 'Contacts', choose the 'Contacts' folder and click 'Next'. 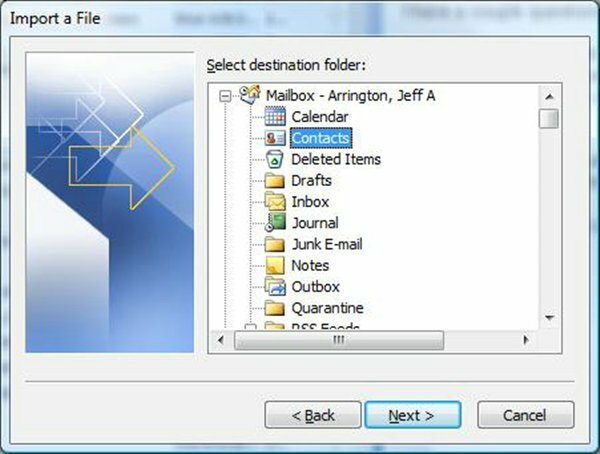 Note: if you were importing the inbox, tasks, or some other folder, you would simply select the proper destination folder in this step. 15 - You are now presented with a verification step. If you are satisfied with the selections that you have made up to this point, click 'Finish' to complete the importation of the contacts. 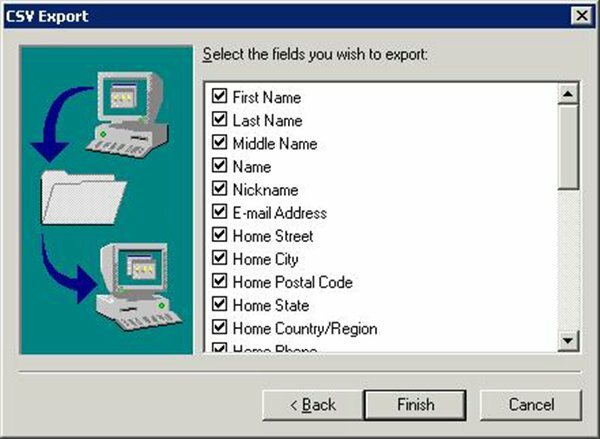 Note: If there are certain fields such as 'Home Phone Number' that you want to be mapped to or stored in the 'Business Phone Number' in Microsoft Outlook, you can select the 'Custom Mappings' button to designate those specifications. 16 - When you have selected finish, you should be presented with a status bar that shows the progress of the importation. 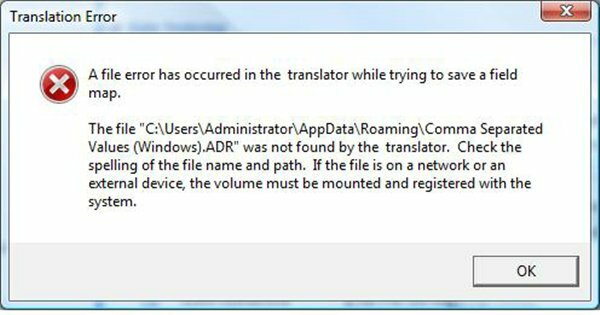 Note: I received the error message before I was presented with this window, pressing 'OK' on the error message allowed the application to continue. 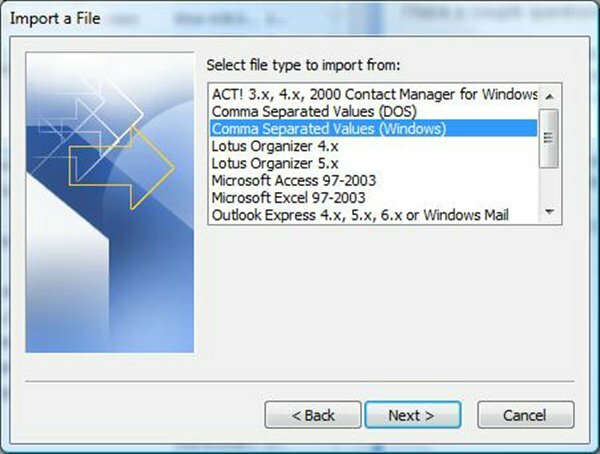 17 - Once the previous windows has completed, it will automatically close and you can now verify that your contacts were imported by selecting the 'Contacts' section on the ribbon on the left hand side of Microsoft Outlook. Note - I received this error message a few times during the steps listed above. I am not sure if it is a configuration issue with Vista or Outlook 2007, but clicking on 'OK' and dismissing the error did not seem to have any affect on the overall success of the importation.